When is All-Flash Storage Better than Hybrid Flash? 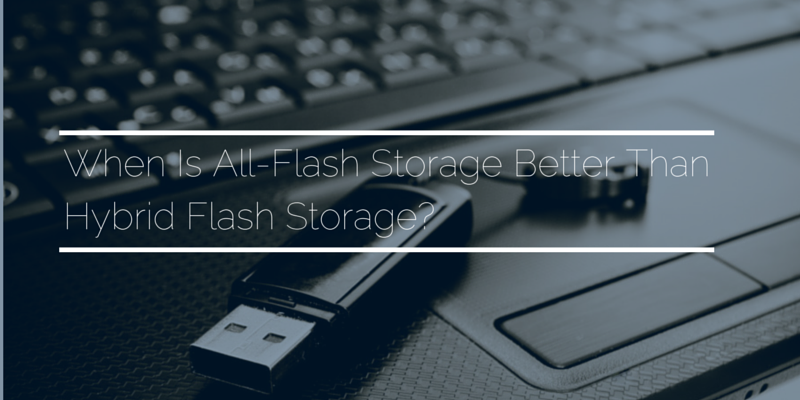 As the cost of solid-state technology decreases and its capacity increases, flash technology has steadily been making inroads into the enterprise storage architecture, to the point where flash has become a standard component of most storage solutions. Just how much flash is necessary, however, is the question confronted by directors of infrastructure who are trying to balance cost with their companies’ needs for high performance. Two of the most powerful flash configurations used in enterprises today are all-flash arrays and hybrid arrays. All-flash storage arrays are independent storage arrays composed entirely of solid-state technology. They are often custom-built solutions created to meet the challenges of a particular workload. Hybrid arrays split the difference between traditional “spinning disk” storage and flash, making use of both technologies in a single array. In a hybrid array, the flash component often serves as a cache for frequently accessed data. As with most IT technology decisions, the choice of all-flash or hybrid storage should depend on what you want to do with it. Hybrid flash arrays can be extremely versatile and, for certain applications, cost effective. At Daymark, we tend to think of hybrid flash as the “Swiss army knife” of storage options: good for a wide range of applications, though not necessarily the best tool for the most demanding ones. All-flash arrays, on the other hand, outshine all other storage options when it comes to the most demanding workloads: virtual infrastructures, virtual desktops, financial databases and analytics. The promise of all-flash storage is the promise of predictable performance. By that, we mean, all-flash storage has the potential to deliver high performance for any number of workloads without the overprovisioning required for traditional spinning disk arrays or the complex tiering required for hybrid arrays. For example, if you were to size an architecture for peak workload for a virtual desktop infrastructure (VDI) using traditional spinning disk technology with some frontend flash, it’s going to be significantly more expensive and have a much larger footprint than an all-flash array handling the same workload. Thanks especially to two powerful data reduction techniques—deduplication and compression—all-flash storage is able to do more with less, in many cases shrinking footprints on a scale of 10-1. And, of course, it’s much faster. Is Hybrid on the Way Out? As the price of all-flash storage continues to drop, we’re beginning to see enterprises turn to it more frequently, even for more general-purpose workloads. It’s conceivable that, in the not-so-distant future, hybrid storage may be abandoned entirely in favor of all-flash. Directors of infrastructure are becoming less inclined to constantly worry about placing their storage on the correct tier and are attracted to the idea of combining all their workloads in the same environment using techniques like deduplication and compression to maintain predictable performance. As the price of all-flash declines, this will increasingly become achievable.